Early editions of DnD -- by which I mean everything up through 2nd Edition, basically -- incorporated a vital ecology based around movement rates, searching, and wandering monsters. That relationship has eroded in later editions, thanks to the introduction of practically instantaneous searching and brisk walking. It begins with surprisingly slow movement rates. Assuming that at least some characters were wearing heavy armor, a party of dungeoneers could explore just 60 feet of tunnel in a 10-minute turn. That seems painfully turtlelike, but as the rules explained, it assumed characters were mapping carefully, trying to be quiet, listening at doors and junctions, and searching for traps and secret doors as they went. They could move faster if they wanted to but only at the expense of stealth and caution. Additional searching, such as tossing a chamber for valuables, was another 10 minutes at least, or more if it was a big room. To illustrate this, look at the sample map here (from the adventure Barrowmaze by Greg Gillespie). It shows the first portion of the dungeon that characters enter. 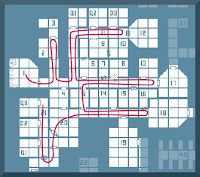 Just mapping it -- that is, walking through the corridors along the path shown and looking into but not actually entering most of the rooms -- takes about an hour and a half of game time at 60 feet per ten minutes. Every fight that breaks out adds 10 minutes (extra time beyond actual combat is spent binding wounds, cleaning weapons, looting the dead, and so on). Fighting everything in this section of the dungeon, as characters are likely to do, adds another 80 minutes. Searching a room adds another ten, so fully searching all 24 rooms keeps everyone busy for an additional four hours. That’s seven hours of in-game exploration and combat. It's unlikely that a low-level party can handle all of this in one go. They'll run low on hit points and spells after two or three fights. When that happens, they will need to retreat and rest for the night. During those seven hours of exploring, searching, and fighting, the DM would also make 30 or more rolls for wandering monsters. Those are likely to trigger four to six more encounters. Wandering monsters are a real headache for dungeon explorers. They deplete your precious combat spells and hit points for very little gain, so you want to minimize them as much as possible. But wandering monster rolls are literally as constant as a ticking clock. As long as you're in the dungeon, those rolls keep happening, and the more carefully you move and search, the longer you’re in the dungeon. Hanging over all of this is knowing that leaving the dungeon can cost you most of the gains made today. When adventurers retreat, monsters move back in. At least some of the chambers that were fought over today will need to be retaken tomorrow from the monsters that reoccupied them overnight. Since the valuable treasure was hauled away yesterday, those fights spill your blood for little gain. In short, a group of explorers needs to deal with these conflicts. To map accurately and protect yourself against ambushes and other nasty surprises, you need to move slowly. To minimize danger from random encounters and get the most from your long-duration utility spells such as find traps and detect magic, you need to move quickly. To cement your gains, you need to press on for as long as possible before retreating for the day. To get out alive, you need to head home before you're so spent that bumping into a wandering monster on the hike back to the exit will end in a TPK. Those concerns aren’t entirely gone from D&D and Pathfinder, but they’ve faded into the background. In fairness, I suspect a lot of DMs always ignored timekeeping; it can be a chore and you inevitably lose track somewhere along the way and must fudge a bit to catch up. Even so, I’ve rediscovered my appreciation for the value of time since shifting B/X from the Memories shelf back to the Active Game shelf, and I’m happy to see so many OSR games paying time its due respect. I decided to actually check on my memory; here are the numbers as I looked them up. The base assumption is a six-member party advancing at the speed of its slowest member, which typically is a dwarf in heavy armor. Only B/X rolls moving and searching into a single number. All the other rules make you ante up time for searching separate from movement, which complicates the math a bit. It would be nice if they all just assumed you tap on the walls and prod the floor with a pole as you go. * I don't have high confidence in this seemingly outrageous number, since I don't get to play much Pathfinder. The rules don't address the issue specifically. Using the Perception skill takes a move action, so searching as you go would seem to cut your speed in half. That's the number I used. You could easily argue it should be half this, on the assumption that there's a lot of broken and rough terrain in a dungeon. ** Another case where the number seems ridiculously high in comparison with the others, possibly because the rules don't really address the issue. A lot of assumptions are involved. It's entirely possible that this number is low by half. I'd welcome anyone doing their own analysis and providing alternative numbers, either to agree or disagree with mine. I've been running the ToEE with my group and for the most part, I've been ignoring the wandering monster tables, using them only when it makes sense to me, especially when the party returns to the temple and/or traversing an area that they think has been already cleared out, or long passageways. Technically, you get two moves a turn, so heavily armoured characters can cover 120' in ten minutes. On the other hand, you have to spend 1 turn out of every 6 resting. I'm not sure of the reasoning behind that rule, but I'm guessing was intended to force players to find defensible locations to wait out that extra wandering monster check. In fact, OD&D's movement is even slower, because those two moves per turn don't include searching. Searching a 10' section of wall for traps and secret doors took an entire turn (for one character, presumably). 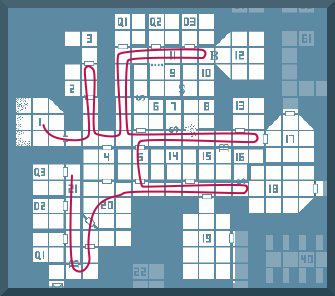 So six characters could advance 75 feet every two turns while searching for traps and doors, which is only 37.5 feet per turn. (I'm pretty sure I got the math right on that.) I'm generous and round it up to 40, just to simplify my job of counting map squares. You also need to factor in (for first edition AD&D) a rest period of one turn for every five spent exploring, or after strenuous activity, including combat (DMG, p. 38). Nice to see you addressing this aspect of D&D resource management, Steve! Great article, Steve: some excellent points in here. I'd love to see some follow-ups on how you DMs and players manage (and mismanage...) time during play too. Agreed. Without the added risk that time/wandering monsters provided, D&D loses one of the dimensions that add to the richness of play. Very nice article, Steve. Time management is an important part of the game's explorations, to me, and I'm glad to see some more thoughts on its impact on game play and adventure design thereof. Excellent blog entry, especially as it relates to the low payout of wandering monsters. I'm going into that dungeon for the treasure, not to beat up on a bunch of no-cash-having critters that make me waste my hit points and spells. I had thought about this variance in the past but never bothered to pull out my books and compare them. I'm considering keeping a stricter track of time in future sessions but I can't say for certain right now how I'll do it. I need to show this post to my players and hear their thoughts first. I've found that it's mostly a matter of habit. I have a sheet of paper (graph paper, often) behind the screen, and I cross off a box every 10 minutes of game time (when it matters). Often I find myself putting one slash through a box as characters advance and turning it into an X when I've caught up with making wandering monster rolls for that turn. Otherwise, those two aspects of time-keeping easily get out of sync. Gotta love time management. It's a great part of the game. I must be reading my 1st edition AD&D Player's Handbook wrong. There's a sentence on page 102 that says "The movement distance in the dungeon is 1" to 10' over a turn of 10 minutes duration while exploration and mapping are in progress." I read that as you can only move 10 feet per 10 minutes if you're exploring, since the very next sentence describes how much faster one moves if you're following a map or route. How did you arrive at 37.5 feet per turn? It is 10' per 1" of movement; so, if you have a movement of 12" then it is 120' per turn. Steve appears to be factoring in time spent searching for secret doors, traps, and perhaps the mandatory one turn in six that has to be spent resting. Since I don't have my notes anymore, I'm not sure how I concluded the movement rate in AD&D was the same as OD&D. In fact, it seems to be an error. AD&D's exploration movement is (10' x movement rate)/turn, with one turn of rest required every hour. That would give a move of 50'/turn, not 37.5. It's implied (but never stated outright) that characters search for traps and secret doors as part of normal, cautious movement, unlike OD&D, which seems to demand that movement and searching are done separately. I corrected that entry to 50'/turn. I assumed that the party advances at the speed of its slowest member, which is generally 6" for the dwarf in plate mail. It's possible to move faster -- at the rate of the thief in light armor who's scouting head, for example -- but then only the fastest characters are searching and mapping. The slower characters won't be contributing. The dwarf, for example, won't notice sliding panels, sloping passages, etc., since the rules do state clearly that these things require full attention. Steve, see pages 96-97 of the DMG for the additional time required to search the dungeon for traps, secret doors and the like.